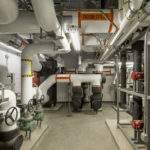 RFS Engineering contacted Emerald Environmental Technologies as an alternate designer for Colgate University’s LEED Silver Certification project. 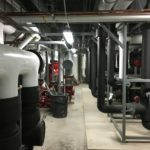 The customer wanted a design that did not require ammonia and eliminated the heavy maintenance costs associated with a standard industrial plant. 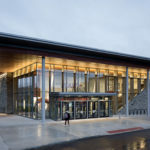 Emerald met with a design team of Sasaki Architects, whom had previous experience with Emerald Environmental Technologies’ ice3 Cube System arena installations at Plymouth State University and University of New England—both of which had RFS Engineering and Emerald Environmental Technologies to complete their installations. 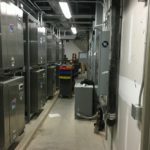 Working with RFS Engineering, Stevens Engineers, and Sasaki‘s General Contractor LeChase Construction a design was formulated to install ten ice3 Cube units totaling 210 TR, with potential expansion to twelve ice3 Cubes. 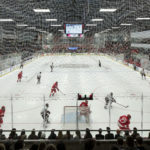 Six of the ten Cube units have the ability to act as a source of air conditioning for the facility, maintaining ice during summer periods of low usage. 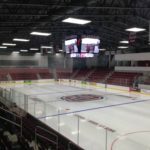 As the November hockey season approached, the AC load diminished and the Cubes were installed in abundance to serve the refrigeration load. 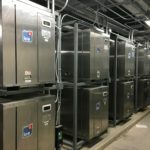 With use of Emerald’s Environmental Technologies Direct Digital Control package, load shedding could be performed in the event that additional priority refrigeration was needed. 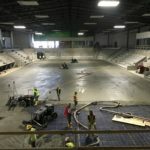 The system employed reclaimed heat during Cube operation for use in snowmelt, warming the locker room floor, and reheating all other spaces including the rink itself. 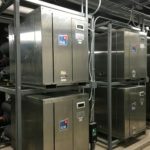 A backup boiler system was installed to maintain a 105-degree Fahrenheit heating loop in periods of low Cube operation for high heat requirements. 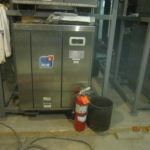 An evaporative fluid cooler was also installed to reject all heat not required by the building. The evaporative cooler was remotely mounted at the rear of the building’s third level, and concealed with screening, so from an architectural point of view, the building had no ground-mounted or exposed equipment. The design worked exactly as intended. 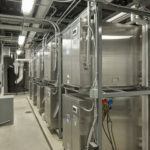 The equipment was designed for multiuse allowing for both air conditioning and heating of the spaces. 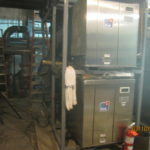 Low temperature back up natural gas boilers were added to the loop under the RFS design, these boilers only operated when refrigeration load went out of sync with heating loads. 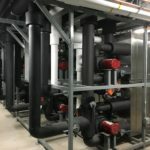 Stress tests were placed on the cube system for refrigeration lowering floor temperatures to 12-15*F – responding correctly and impressing the end user and engineering team. 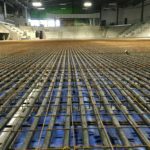 It was proven that modular ice3 Cube technology was of great benefit in a rink that went from zero to 100% occupancy in a matter of an hour. Additional ice3 Cubes have not proven to be needed as the load shed controls in place have mitigated the need. 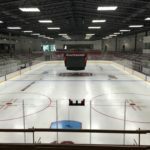 The Colgate Facilities department has maintained and provided any minor repairs these past few years and are well within control of this technology.